So many wonderful ideas here, I am in the middle of making some using old shoe boxes. But I am loving your ideas here. Will check them all out, I love getting inspired ..
Oooh I want to try some of these. I especially like the gold dipped concrete. I love the chalkboard planters. I’m off to Walmart soon and will look into purchasing what I need! I need to get some new houseplants. Thanks for the great ideas. I need to try some of these. I love cute craft ideas. These would be fun to make with my daughter. She loves seeing her art around the house. I love the gold leaf ones. So cute! Will have to try to make one! Ooo…I was just telling my nephew how we should make some cool planters for an herb garden – love this! 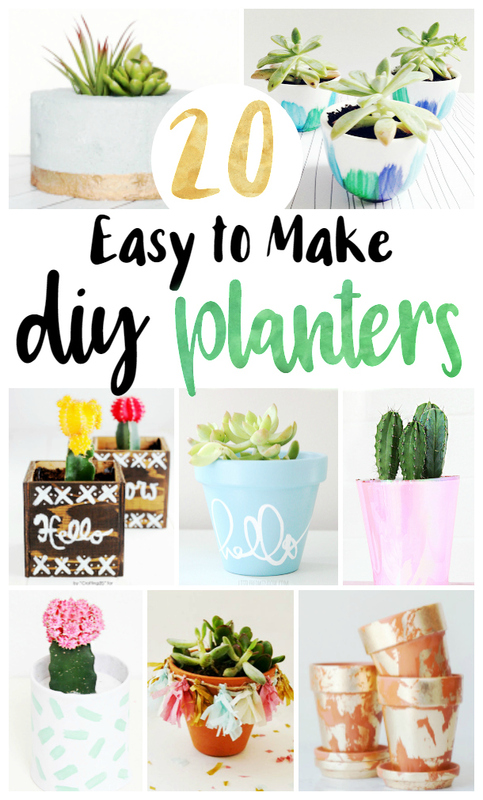 These are some cool planters! What great ideas!!! I get tired of the same clay or plastic colored planters everywhere. I could even get the kids involved with the project. I love this idea. I just became really obsessed with planters and flowers and fake flowers. I been trying to look up cute DIY projects to work on and I think I may take some of your ideas and look through them. They are all very nice & simple/cute. I love plants and flowers and watching them grow. All of these planters are interesting and would add so much to our home. These are so creative – love it!! Wonderful ideas! I always get plant fever in the spring and want to fill my house (and yard) with new plants! What a great idea! I love these. Thanks for sharing. Thanks for sharing! I will be trying a few of these to bring some greenery indoors.